Please add staff in the following steps. This will both ensure that your staff are set-up correctly, it will also save you time. 1) In your SETTINGS menu, add the appropriate Staff Types. 2) In your SETTINGS menu, add the appropriate Staff Access Levels. Then set the details for each staff access level. For instance, you might want to add a Level entitled "Intern" and then set the individual specifications for Intern as "Can View Calendar Items," and "Can Not Export." 3) In your SETTINGS menu, add your desired Custom Staff Fields. These are any fields that you would like to track for your staff that were not initially included in the program. Follow these instructions and select Custom Staff Fields. 4) Finally, In your EDIT menu, select Staff, then Add. When adding individual Staff members, select Active or Inactive (which determines if they can log-in or not), add their staff type, name, initials, email address, a password of minimum 6 alphanumeric characters, and access level. 5) To invite your staff to the program, please click MAIL from your homescreen to go to your Mail Manager. Under TO: select All Staff. 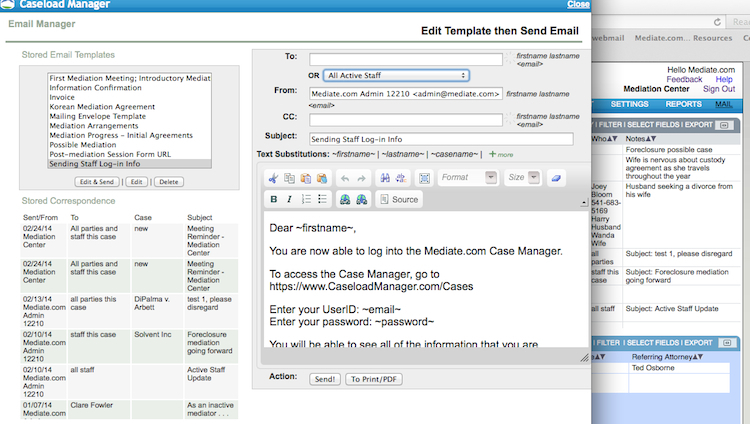 Under Stored Email Templates, select Sending Staff log-in info, then Edit & Send. Edit the text of the email if desired, and select Send. This email will send a personalized email to your staff, giving them their own log-in information.